Selling a boat is about more than just selling a boat - it&apos;s about selling the boating lifestyle. It&apos;s no surprise that the more positive, memorable experiences consumers have with their boats, the more likely they are to take them out of storage after a long winter, pay for upkeep and service, outfit them with new accessories and eventually move up to other boats. "A lot of companies can just sell a boat, and we see it as our job not just to sell you the boat but to make sure you&apos;re having fun with it and enjoying it and enjoying the experience," says Tom Whowell, owner and sales manager of Gordy&apos;s Lakefront Marine, with locations in Wisconsin and Illinois. "If they have five or 10 great experiences with their boat throughout the summer, they&apos;re going to stay with it," he says. "It&apos;s the people who have one or two experiences - they don&apos;t have any reason to go boating and then after a year or two or three they give it up altogether." And it&apos;s not just about getting customers out on the water - it&apos;s about keeping them involved in boating throughout the year. For example, in addition to the more traditional summer events, such as raft-ups and cruises, Whowell started hosting a party last winter on frozen Lake Geneva, and the dealership also does a "tailgate" party in the harbor before a Chicago Bears game at Soldier Field. "Here&apos;s an event that&apos;s already going on, but let&apos;s put a boating twist on it," he says of the tailgating event. "Most people wouldn&apos;t think of going to the football game by boat, but why not?" Whowell adds, "We really take a lot of pride in the events. 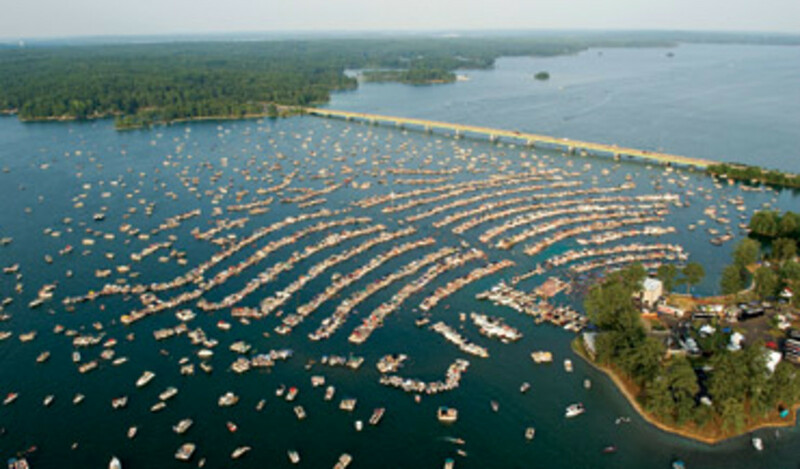 We think it adds to the customer experience overall, whether they&apos;re boating-related events or just a company event." 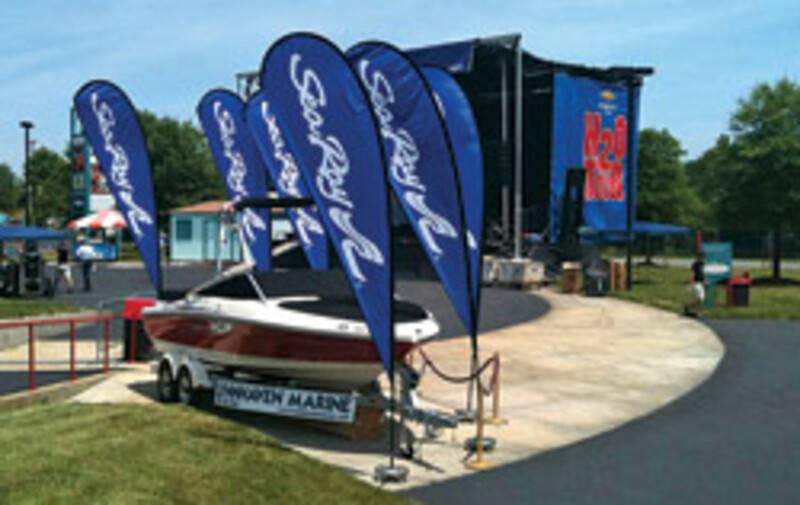 This summer Sea Ray is a sponsor of country singer Brad Paisley&apos;s H2O tour. At each of 45 concert venues, Sea Ray, along with Skinny Water, is setting up the Water World Plaza, which will feature a boat display as well as a fishing simulator, swimming pools, and other water activities. "We&apos;re looking at every opportunity to put our products out in front of people that otherwise would not have the opportunity to do so," says Rob Noyes, Sea Ray vice president of marketing. The event also gives dealers an opportunity to drive traffic to their showrooms by working with radio stations to give away tickets to the concert and other promotions. "Sea Ray&apos;s position is the industry is not getting enough showroom traffic right now, so we are chasing every opportunity to bring boats to the people and put our products in front of people that are not walking in the showroom" Noyes says. "Yeah, we&apos;ve got a piece of fiberglass to sell, but if they&apos;re not into the boating lifestyle, they&apos;re not going to buy it," he says. Noyes and others say events that build a brand or promote a dealership can be just as important as those focused strictly on selling boats. Missouri-based Glencove Marine, for example, sponsors traditional events but also hosts a weekly call-in radio show on boating - the only boating radio show in its market. "Our slogan is &apos;For the Love of Boating,&apos; and that&apos;s the name of the show," says Roger Hulett, a spokesman for Glencove. "It really establishes us as the boating leader. Does that get us customers down the road in a roundabout way? We think it does. ... It establishes us as kind of the leader in the market." Hulett says that in addition to its Formula Fridays - social events for its customers - Glencove also teams up with local businesses and media outlets for promotions. Even if it doesn&apos;t have much to do with boating, such as the talent competition it recently sponsored, anytime a dealer&apos;s name is in the public eye, it&apos;s a good thing. "It&apos;s another opportunity for our boat owners, our customers or even non-customers to come to an event and [for] us to network with them and interact with them at a fun family event and hopefully move them over to where we want them to be when it&apos;s time to buy a boat," he says. "We try to stay very, very visible." Sea Ray has promotions other than the Paisley tour going on this summer, some of which are not directly related to selling. Its largest event, AquaPalooza, is not focused on selling, but the hope is that it will lead people into showrooms. This is the fifth year Sea Ray has held AquaPalooza, a series of free on-water celebrations that feature music and other family-oriented activities. Events take place in more than 100 markets throughout July, and as of the end of May more than 25,000 people had registered for the events, up from 11,000 last year. The Signature Event alone, which will feature Paisley at The Reserve on Lake Travis near Austin, Texas, had about 12,000 people registered by the end of May. Sea Ray dealer Sail & Ski Center is hosting the event. Noyes says he recently was at a dealership in Texas, and two boats were sold to people who wanted to attend AquaPalooza. "Yes, there is some conversion there, but when we engage in lifestyle marketing, that is brand-building versus retail- focused," he says, adding that fellow Brunswick brand Boston Whaler is starting its own event this year called FishTopia. 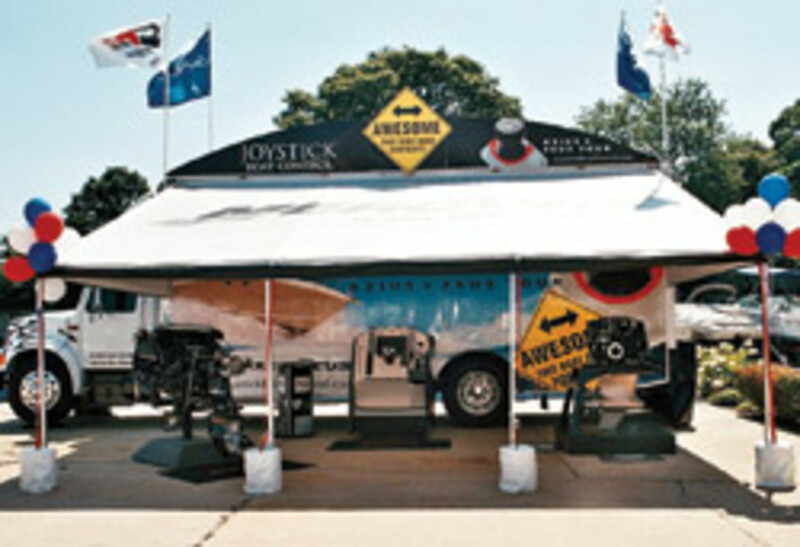 Many dealers stick with tried-and-true methods of engaging and retaining customers, such as boat shows or demo days. 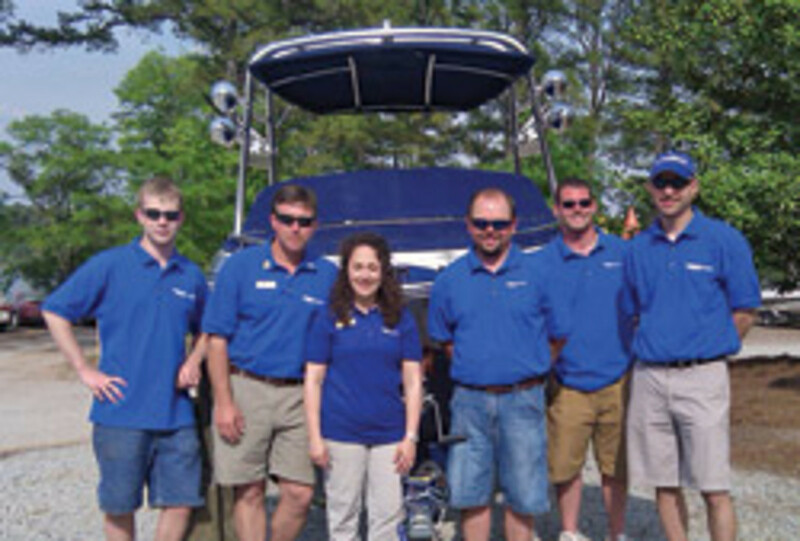 Travis Hayes, owner and general manager of Hayes Marine in Appling, Ga., does an open house/in-water boat show each April. It&apos;s a stand-alone event that helps promote the dealership, with a social aspect for customers. "We&apos;ve only done it for three years, but it&apos;s turned into the most important customer interaction I have," Hayes says. "People want to hear the stories and meet the owners. It gives us a better time to interact with people." While he does other "parking lot shows" in his area, Hayes says having his own event is important for differentiating himself from the competition. Most customers go to those other types of shows to gather information or get the best deals, he says. "The open house tends to give folks a reason to come by and just do a social visit," Hayes says, "The first two years we didn&apos;t even sell anything. This year we sold two boats out of it. We were pretty happy with that. It&apos;s a huge step forward." Noyes says Sea Ray dealers around the country will be hosting "Joystick Revolution Demo Days," which allow consumers to experience joystick maneuvering using the Axius and Zeus propulsion systems. Sea Ray also has a partnership with Costco to display its boats and offer specials through the retailer&apos;s auto-buying program. "It&apos;s just been unbelievable for us," Noyes says. "We don&apos;t have access to those customers unless we structure those kinds of deals." Glencove Marine also hosts demo events several times a year, as well as participating in boat shows locally and regionally. In April, the company was the first to debut a 2011 Formula, which it sold at the show, Hulett says, and the dealership has sold two more 2011 models. Noyes says Sea Ray will sponsor or take part in about 350 events this summer, some selling events, some lifestyle. In all, millions of people will hear the Sea Ray name, see the logo or a boat or in some way come in contact with the brand. "All I need are 5,000 people to buy a boat this year and I&apos;m happy. That&apos;s reality," Noyes says. "Sitting back, we are not."